Maybe I added an hour or so to my eight-hour drive, but I absolutely enjoyed this unfamiliar, winding road through the West Virginia mountains. During a lull in the off-and-on rain, I stopped at Hawks Nest State Park near Ansted and hiked one of the trails to a scenic overlook. 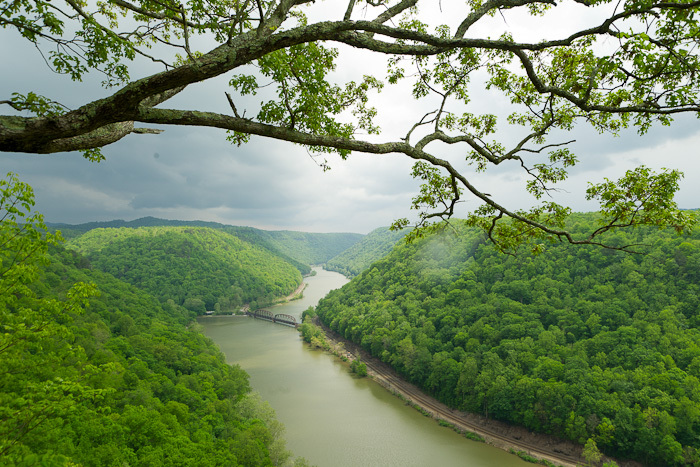 The sun made a brief appearance while I shot the stunning view of the New River Gorge National River and the surrounding vistas. I could have happily stayed longer, but I knew I still faced another four hours in the car. So, it was back on the road again, and although I arrived at my destination a bit late, getting off the beaten path was an unexpected treat.